In this article, the content focuses only on the in product notifications and interface for the quality control process. Help! I have a document with a half moon or exclamation point, what does that mean? All Dossier users will have their letters Quality checked before they are sent. This process takes at most 4 days. However, processing could take longer depending on the overall volume of letters received. If a document is marked as a problem document, it will not be able to be sent, unless specified by the user or the letterwriter. If it is marked as missing features, it will be marked with a 'Warning', and it will still be able to be sent. Some qualities can be ignored at the applicants discretion by clicking on the article title. All letters received by premium Dossier Deliver users will have their letters quality controlled when received, OR when they upgrade their account. 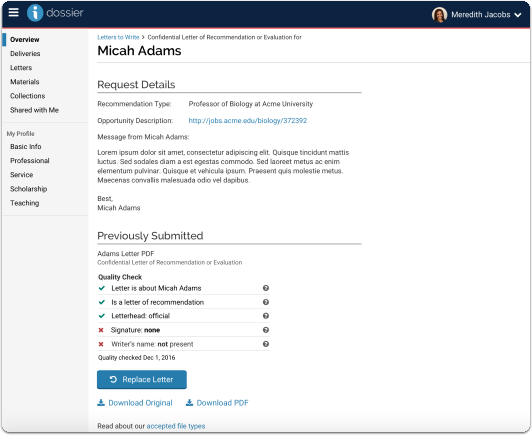 No letter QC for basic Dossier users, but letters can be checked upon request. If you wish to have a more detail explanation of this feature, please reference this other article about the feature. Help! My letter went through the QC process and there is a half moon or exclamation point! Letters with no signature or letterhead will have this status. This status alone will not cancel a delivery but is a warning to the user that if you need these items, you should reach out to your recommender to get an updated letter. The recommender will not be notified. Exclamation Point = Problem document. Letters with this status should prompt us to cancel this delivery. The recommender of this letter will be notified about the issue. Click on the title of the letter from your letters page, or the link to the issue from the Dossier homepage. When viewing the detailed results, you can find instructions within the product by clicking on the issues link on the homepage. 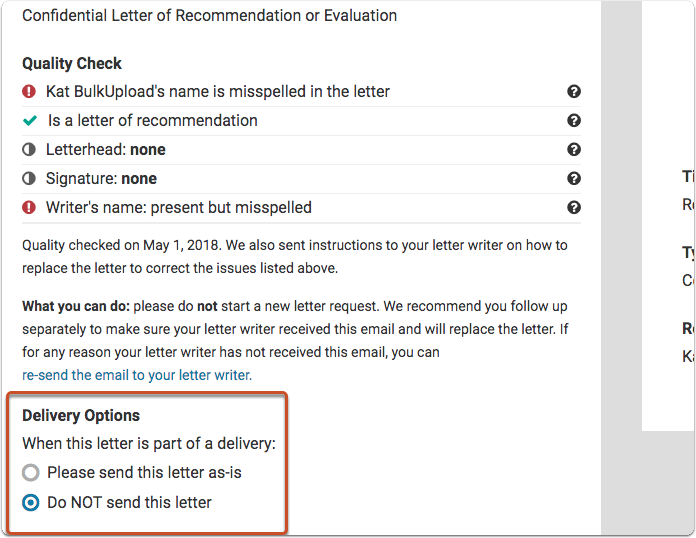 If a letter has been flagged as having an issue, you can choose to ignore it, your letter writer can send the letter to the URL within the notification email they received regarding the issue(s), or they can send the letter to help@interfolio.com. Below are all of the locations where a Dossier user can check the status of their letters that have been submitted to be QC'd by Interfolio. 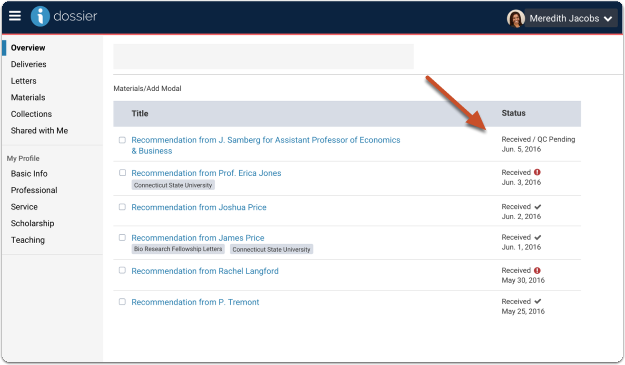 Deliver users will see notification on the new homepage if any of their requested letters have issues, they can click on the link for more detailed information on the letters. The status of the letter will appear listed on the materials page in the Status column, along with the other document statuses. *The QC status will only be displayed for letters that have been received. A red exclamation point means that an issue has been with the relevant letter. A checkmark indicates that the letter has passed the QC process. The QC status will appear in a "Quality Check" column, as displayed below. "Pending" means the letter has not yet been processed yet for Quality Check. A red exclamation point indicates an issue has been flagged. A checkmark indicates that the letter has passed the QC process and is ready to be sent. 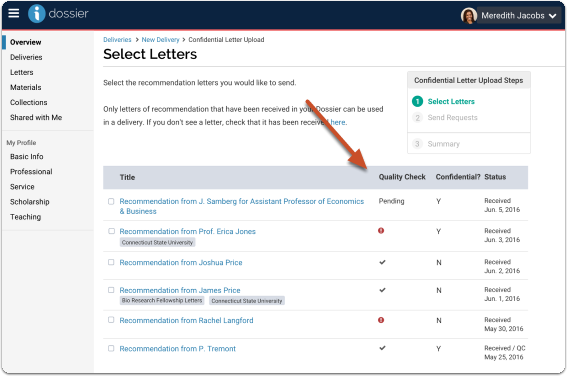 On the Letters page, 'My Letters of Recommendations' tab, users can view a summary of the QC process for all of their letters. Below is an example of the Letters page, with a Quality Check column. How to view the detailed results, and make an exception, from the Quality Check process? 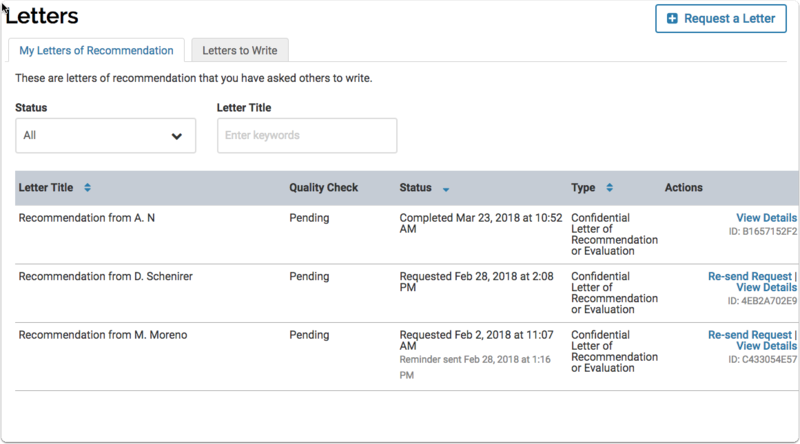 If a letter needs to be replaced, then we recommend the letter writer submit the updated letter to the URL within the notification email that they received when the QC process was complete. 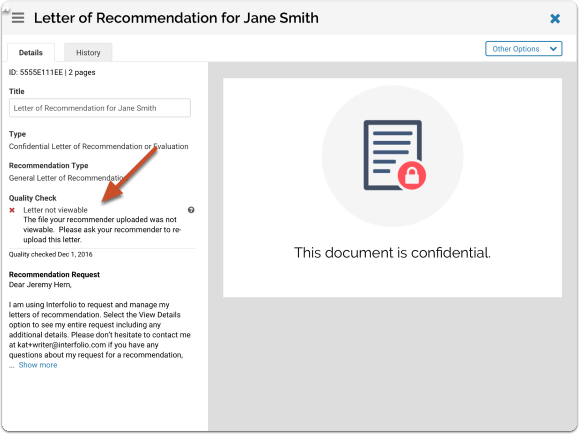 Note: Only letter writers can view the letter contents within Interfolio Dossier, applicants/recipients will just see a notification about the document being confidential. 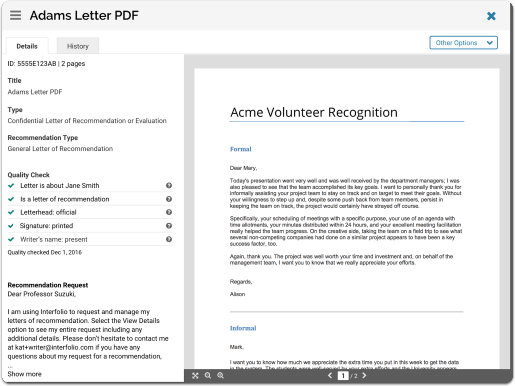 If the letter has issues, letter writers can navigate to this page by way of the notification email, or by logging into their Dossier account to manage the letters that they have written. The letter writer will be able to see a screen where they can correct errors by replacing the letter, as displayed below.